Click "Download ZIP" on the right side of the page and save the zip file. Then unzip it. Rename the folder "IRRemote" (unless that name is already being used). Then copy the folder into your libraries directory. The libraries directory should contain the folder "IRremote." If for some reason you already have a folder with this name, then you may need to rename it. The IRremote folder should contain the files. A lot of problems experienced when uploaded in the code, are caused be the library not being loaded in the correct location. UPDATE: In version 1.5.8 of the Arduino software, several of the default libraries were changed. This created duplicate IRremote libraries. So if you encounter errors, this is likely the source. I have attached a copy of the library with the file names changed to avoid the conflict. Just unzip it. Then copy the "Arduino-IRremote-master2" folder into the libraries folder in the Arduino program folder. // check if the record button is pressed. This circuit uses a 38 kHz Infrared Receiver Module to detect the signal from the remote. The right pin of this connected to 5V. The middle pin is connected to GND. The Left pin connects to digital pin 11 on the board. The circuit also has two indicator LEDs. One indicates that the receiver is in programming mode and the other indicates whether the output is on or off. One end of each LED is connected to GND. The other end is connected to a 100 ohm series resistor. The resistors are then connected to digital pins 3 and 4. A momentary switch is used to set programming mode. One end of the switch is connected to 5V. The other end of the switch is connected to digital pin 6 and a 10 kohm resistor. The other end of the resistor is connected to GND. An optional relay/relay shield can be connected to digital pin 2 and GND. You can add any additional outputs that you want. This can let you control multiple devices or multiple functions on the same device. When the Arduino is powered, the output indicator (green) LED should turn on. This indicates that the output at pin 2 is HIGH and can be used to activate another circuit. To program the receiver, press the button. When the button is released, the programming mode indicator (red) LED will turn on. Now point your remote at the receiver module and press a button. If the Arduino registered the signal, the programming mode LED will turn off. The receiver is now programmed. Pressing this button on the remote again will cause the output at pin 2 to toggle between off and on. The output state is indicated by the LED. You can use the signal from pin 2 to activates another circuit directly or you can use a relay/relay shield to turn an appliance on and off. If you connect the Arduino to your computer you can use the serial monitor function to observe the value for the signals that you are programming. After testing the circuit on a breadboard, you can solder it together on a printed circuit board. The IR receiver module, the switch and the LEDs would be mounted to the housing. So I connected them to the board with jumper wires. I added a small relay that would be activated by the output of pin 2. In most cases you will want to connect a relay driver circuit. This is because the maximum output of an Arduino digital pin is 40 mA and most relays require more than this to operate. However, I found a relay that only required 25mA to operate. So I was able to connect it directly to the digital pin. It is always a good idea to attach a flyback diode across the terminals of the coil of a relay. This helps to protect against voltage spikes when the relay is turned off. The relay can act as a general switch and activate just about anything. In this case, I attached an extension cord. This will allow it to act as a remote controlled outlet. Always check to make sure that your relay is rated high enough for your intended load. Now you need to find a good insulated housing to hold your project. I used a 6x3x2 plastic project housing from RadioShack. On one end, I drilled two holes from the LEDs, one hole for the IR receiver and one hole for the switch. Then I made holes in the opposite end for the Arduino power cord and the extension cord. I used hot glue to secure the LEDs and the Receiver. The switch was held in place with its own nut and lock washer. You can also use hot glue to secure loose wires and to hold the boards in place. Be very careful not to accidentally pull any wires out of the Arduino as you are fitting everything into the housing. 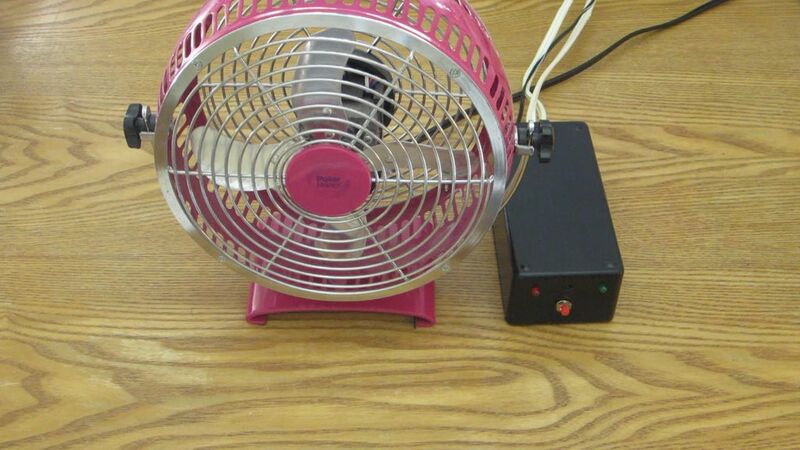 Plug in the power supply for the Arduino and it will automatically turn on. Then plug the male end of the extension cord into an outlet and plug the device that you want to control into the female end of the extension cord. The device should turn on. To program the receiver, press the red button. The red light will turn on. Then point your remote at the receiver and press a button. If the Arduino registered the signal, then the red light will turn off. Now you can use that button to turn the attached device on and off. 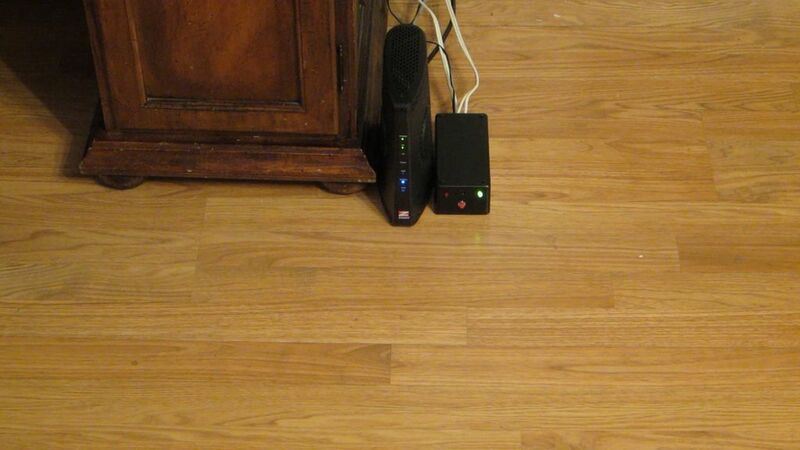 You can use this to remotely control lights, fans or even your coffee maker. If you plug the Arduino into your computer, you can use the Serial Monitor tool to view the value of the IR signals for the various buttons on your remote. This gives you the option of manually inserting these values into the code. By doing this you can program responses to multiple buttons. It also means that you will not have to reprogram the receiver whenever the power is disconnected. Thank you for all this information. But i am getting this error. Please help me with that. I don't know. This is a really old project. The libraries might have changed in the mean time. Cut one of the two wires in the extension cord. Then solder each of the cut ends to the switch terminals of the relay. I am not sure that I understand the problem that you are having, could you please try to give me a little more detail? Hi, I would like to make a setup where I have a stationary bike and when I stop pedaling, the TV would turn off. Any idea how to do this? I assume using a photoeye, and arduino, and a IR signal would work. Would just like it that if I stop pedaling an IR Signal would be sent to the TV to turn it off. Any ideas would be much appreciated. First you want to test the part of the circuit that comes before the relay. You can do this by replacing the relay with an LED and a resistor. If the LED lights up, then you know that the rest of the circuit is working and the relay is getting power. If all that is working, then you want to make sure that the relay is getting enough power. Some relays require more current than the digital pins can output (about 20 mA). Then check all the connections with the appliance that you want to power. thank you for answering sir, I tried what you said that I should try first an LED and a resistor and it did light up. But my problem is the relay the relay only requires only 5VDC input. The mA that the relay can handle printed in it is erased. My question is that, can i use a transistor for pin2 ? So that i could supply 5V to the relay to switch on? I'll connect 1 of the pins of transistor to 5V of the arduino, then GND for the other pin, and then i would connect the coils of the relay to the 5v and GND of the transistor. BTW im using a BC548 transistor. Hope you would answer. Very well appreciated your first answer sir thanks. Yeah. You can use a transistor to activate the relay. How much cost and time will it consume?? The most expensive part would be the Arduino. I couldn't give you a detailed list of part prices because I used parts that I already had. I built it in about 10 hours. Many Thanks for this project< I really liked & i make one like this & it's work properly. Please can you help me to do this. Duplicate and sections of code that you want to reuse. Just be sure give all the new stuff unique variable names.